Learn jazz guitar harmony in a logical, step-by-step way that is always focused on gig-ready applications. 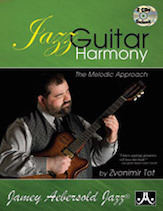 Harmony-melody relationship is explored in detail via "hands on" examples that start with simple voicings over common chord changes (ii-V-I, I-vi-ii-V and others) and moves on to comping over well-known jazz standards and blues. The standards are fully notated with beautiful and lush passing chords in the style of the great guitarists. Finally, learn how to harmonize jazz heads.